Keeps skin soft and moisturized. 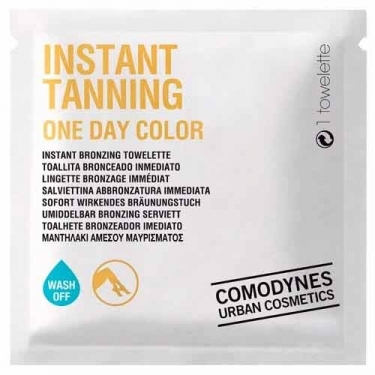 DESCRIPTION: Instant Tanning One Day Color from Comodynes are self tanning wipes that help give a natural and even tan to your legs throughout the day while keeping your skin smooth and moisturized. Tanning care that results from the combination of active ingredients: DHA Plus and active moisturizing for a uniform and moisturizing tanning action for naturally tanned, soft and hydrated legs. Each towel browns 2 legs, without sunscreens, without parabens, without dyes and without perfume. Wait for a while until the product is completely absorbed through the skin.